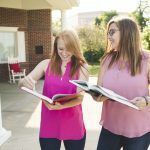 Each year, it will be expected that all Alpha Sigma Alpha volunteers complete the evaluation process. Your feedback and insight about your volunteer position, experience and needs are necessary in our efforts to provide you with all the training, resources and support to make your volunteer experience the best it can be. Volunteer Self-Evaluation: All region and national volunteers will complete the self-evaluation form. It takes between 15-20 minutes and covers topics such as volunteer support systems, trainings, resources and overall volunteer experience. Volunteer Annual Evaluation – Supervising Volunteer: This form will only be filled out by the supervising volunteer, the region facilitator or national team leader, for each of her team members. It mirrors the questions in the self-evaluation form. Conversation: After both the volunteer self-evaluation and supervising volunteer evaluation are submitted, the supervising volunteer will receive both completed forms and schedule a one-on-one conversation with each volunteer that they oversee. This conversation will cover any issues, achievements or discrepancies between the first two forms. Volunteer Post Evaluation: Once the one-on-one conversation is completed the post-evaluation form will be submitted. It will contain a brief synopsis of the topics covered in the conversation and any conclusions reached. Supervising Volunteer Feedback: After the first four steps are completed, each region volunteer and national team member will receive the supervising volunteer feedback form. This form takes 5-10 minutes to complete and will provide feedback to their supervising volunteer.